NDN consumer application with more advanced congestion control options. This app uses the algorithms from "A Practical Congestion Control Scheme for Named Data Networking" (https://dl.acm.org/citation.cfm?id=2984369). It implements slow start, conservative window adaptation (RFC 6675), and 3 different TCP algorithms: AIMD, BIC, and CUBIC (RFC 8312). Size of this type is 896 bytes (on a 64-bit architecture). Definition at line 46 of file ndn-consumer-pcon.hpp. Definition at line 88 of file ndn-consumer-pcon.cpp. Definition at line 34 of file ndn-consumer-pcon.cpp. References ns3::ndn::AIMD, ns3::ndn::BIC, and ns3::ndn::CUBIC. Definition at line 105 of file ndn-consumer-pcon.cpp. 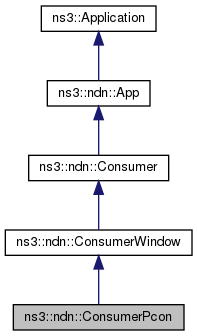 References ns3::ndn::ConsumerWindow::m_inFlight, ns3::ndn::ConsumerWindow::m_window, ns3::ndn::Consumer::OnData(), and ns3::ndn::ConsumerWindow::ScheduleNextPacket(). Definition at line 139 of file ndn-consumer-pcon.cpp. References ns3::ndn::ConsumerWindow::m_inFlight, ns3::ndn::ConsumerWindow::m_window, and ns3::ndn::Consumer::OnTimeout().